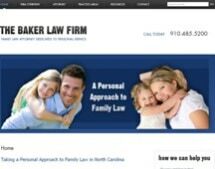 At Baker Law Firm we offer a personal approach to family law. We handle all aspects of family law, to include divorce, child custody, child support, alimony and property division. We have experience with military divorce and dealing with those issues that are specific to our military personnel. Attorney Baker has also received training, as well as experience, as a family law mediator as well as collaborative law, which provides clients with the ability to resolve their case without the stress and financial hardship of trial. We also have the upmost respect for our military personnel and therefore we offer a free consultation for active duty military and retirees.